First, I heard Capitan Brad and his daughter Brianna in Episode 14 – Walking with Family. Brad wrote this sweet guest post, A Father-Daughter Camino. 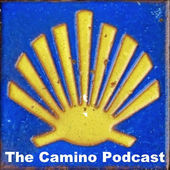 Then I heard Cathy Sietchik Diaz interviewed in Episode 15 about the first six stages of Camino Francés—St. Jean Pied de Port to Pamplona/Cizur Menor. She wrote Walking the Camino as a couple for the Camino Love Stories feature. Finally, I heard Jenifer Hoffman in Episode 24 talk about her reverse Camino. I featured her wonderful blog for Friday Favorites in this post, Jen’s Camino Journey: Slow and In Reverse. I’m sure that I’ll hear a lot more familiar voices as I catch up on six months of episodes. The Camino Podcast is featured on my Camino Resources page, and now the Facebook page is on my Favorite Camino Blogs page.